Huawei unveiled the Mate 20 Pro and Mate 20 today. 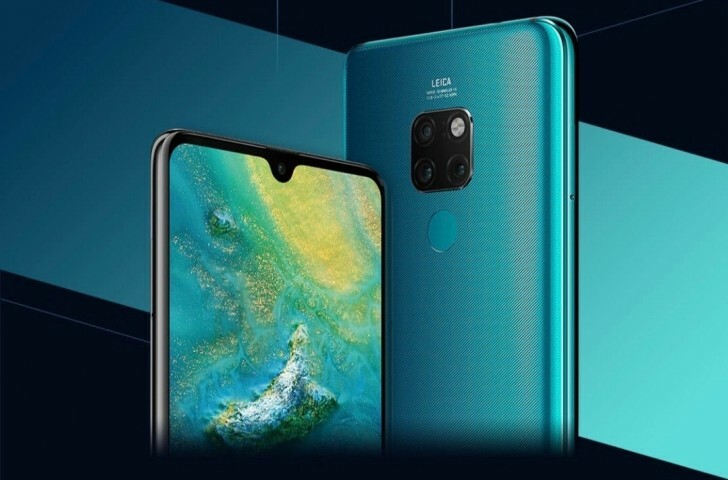 The Pro model sets a benchmark in camera and charging technologies, but even the base Mate 20 enjoys the power of Android’s first 7nm chipset and a revamped Leica camera. The Huawei Mate 20 Pro stands apart from its sibling with a more advanced screen and camera. We start with the 6.39” curved OLED display with 1,440p resolution and HDR support. 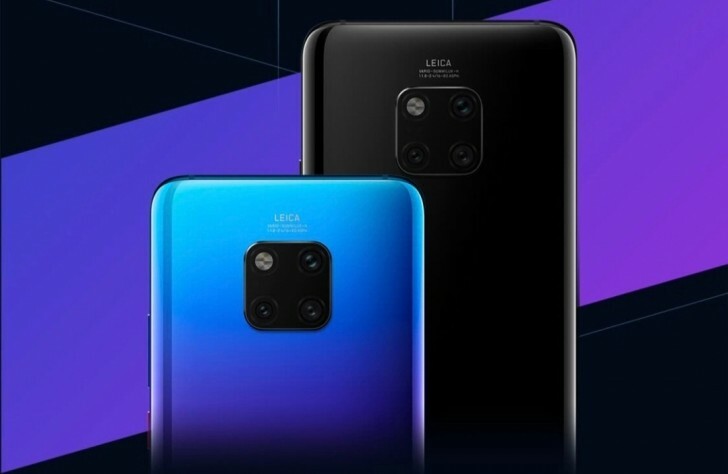 The triple camera here is descended from the P20 Pro camera. It combines a 40MP Quad Bayer sensor with f/1.8 wide-angle lens, a 20MP sensor with f/2.2 ultra-wide lens and an 8MP 80mm f/2.2 telephoto camera. The Mate 20 Pro can do macro shots from just 2.5cm / 1in. Video gets a helping hand from AI Cinema Mode, which can adjust the color tint, saturation and brightness of a clip to enhance the mood. Selective desaturation can render people in full color upon a black & white background. Speaking of AI, Huawei’s new chipset (more on it in a bit) is powerful enough to bypass the cloud. It can, for example, detect similar videos and extract sections of them to make a 10-second highlights reel. 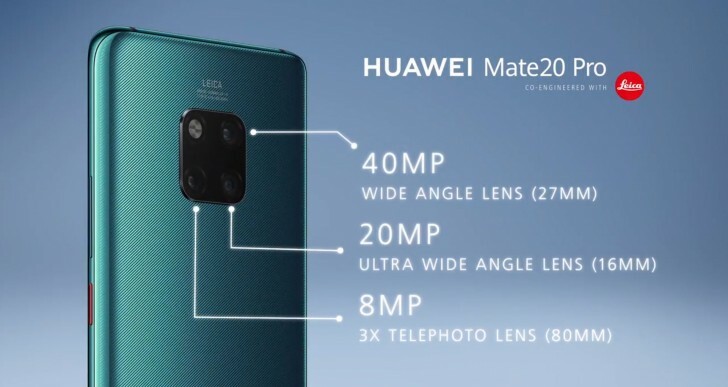 Back to the camera department, the front features a 24MP selfie camera (f/2.0) and a 3D face scanner. Additionally, there’s an in-display fingerprint reader that’s also pressure sensitive. The Pro is the first Huawei to feature the new SuperCharge tech. It pushes a whopping 40W of power and can fill 70% of the 4,200mAh battery in just half an hour (that’s about 2,940mAh). TUV Rheinland has certified that the tech is safe. Then there’s 15W Wireless Quick Charge, which gets the battery from 0% to 30% in half an hour (1,300mAh). And here’s a unique trick - Wireless Reverse Charging can share the phone’s juice with other devices. The Huawei Mate 20 Pro boasts stereo speakers with an interesting design choice – there’s no grille on the bottom, instead the hole for the USB-C port is used. We don’t know if this helped or not, but the Pro now has IP68 waterproofing (the P20 Pro had IP67). Interesting tidbits from the connectivity section include Dual band GPS and Dual VoLTE. But wait until you hear about the memory card (spoiler: it’s not microSD). The Huawei Mate 20 has a very different screen – a 6.53” flat LCD with 1080p resolution. Another change is the triple camera. It’s still ultra-wide, wide and tele, but with different sensors and lenses. Huawei’s new flagships are introducing the Kirin 980 chipset. It’s the first 7nm chip for Android phones and also the first to use ARM’s new Cortex-A76 cores. All together, the new chipset is made up of 6.9 billion transistors, 60% more than its predecessor. Part of the increase is due to the larger A76 cores. They promise a 75% boost in performance and 58% improved power efficiency over the A73 cores in the Kirin 970. The CPU in the Kirin 980 is a three tier design – two A76 as the big cores, two more A76 as medium cores and, finally, four small A55 cores. The new phones will run EMUI 9.0 out of the box, which is based on Android 9.0 Pie. The chipset features a dual NPU for all the AI tasks, part of which are memory optimizations to ensure a smooth performance. The Huawei Mate 20 is available today with 4GB or 6GB of RAM and 128GB storage. 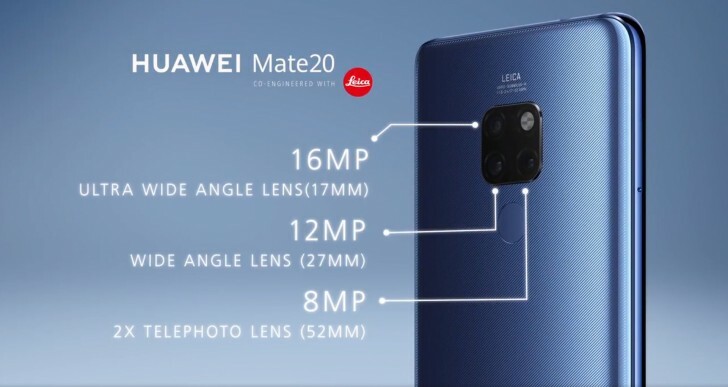 The Mate 20 Pro comes only in 6/128GB configuration. You can find more about the pricing and availability of Mate 20 phones here. Huawei partnered with Toshiba to introduce a new nano memory card format. They are hoping to get the backing of the SD Alliance and make this a global standard, but that sounds like it may take a substantial amount of time to materialize. For now, these cards can expand the phone’s storage by up to 256GB. Yes, it does have the standard Face Unlock features. Even cheaper Honor 8x have it lol.